Search the books on our Google Book Shelf. Just click on the image on the right. Refer to "After 1066" on the Norman Conquest Schools Site http://www.allabout1066.net/intro.htm. BBC History describes in some detail what happened after Harold died in the Battle of Hastings. 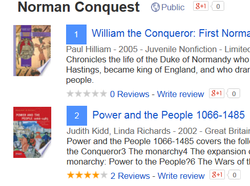 After clicking on the link, scroll down to the heading "King William" to find read a description of the Saxon resistance to the point William is crowned: http://www.bbc.co.uk/history/british/normans/1066_01.shtml. "The Bid for the Throne of England"